The first event of the newly formed ITTF Challenge Series was a standout fixture in March as table tennis fans gathered in Minsk to witness a host of talent at the 2017 Belarus Open, while the month also featured action from the 2017 Italian Junior and Cadet Open and the 2017 Paraguay Junior and Cadet Open and plenty of news ahead of the upcoming Liebherr 2017 World Championships. Following two qualification days hosted on Tuesday 15th and Wednesday 16th March the 2017 Belarus Open officially took place from Thursday 17th to Sunday 19th March at the Palace of Tennis venue. Notable players from across the globe participated at the Challenge Series event, as spectators were treated to a terrific display of table tennis in Minsk. Japan’s Hitomi Sato emerged successful in the Women’s Singles draw, seeing off fellow countrywoman Honoka Hashimoto in the final (11-9, 11-2, 11-8, 5-11, 11-4). How many times did Samsonov already win the Men’s Singles title at the Belarus Open? Comment your answer on the Pongcast post via the ITTF Facebook page and share the video for a chance to win a piece of Nittaku gear. Two ITTF World Junior Circuit events also took place in March as Lignano, Italy and Asunción, Paraguay hosted the action. Germany took home both the Junior Boys’ Team and Junior Girls’ Team titles at the 2017 Italian Junior and Cadet Open, while Brazil dominated the 2017 Paraguay Junior and Cadet Open with six out of the 10 available trophies going to the country’s representatives. The Liebherr 2017 World Championships is almost upon us with the competition set to commence in Düsseldorf, Germany on Monday 29th May and some exciting news surrounding doubles pairings for the tournament was announced in March. China’s Ma Long and Germany’s Timo Boll partnered up for the Men’s Doubles competition at the Qoros 2015 World Championships in Suzhou, and the duo are set to form a team two years later for the Men’s Doubles draw in Düsseldorf. Another high profile pairing announced for the Men’s Doubles category is the combination of Fan Zhendong and Xu Xin, while Fang Bo and Petrissa Solja will aiming high in the Mixed Doubles draw. 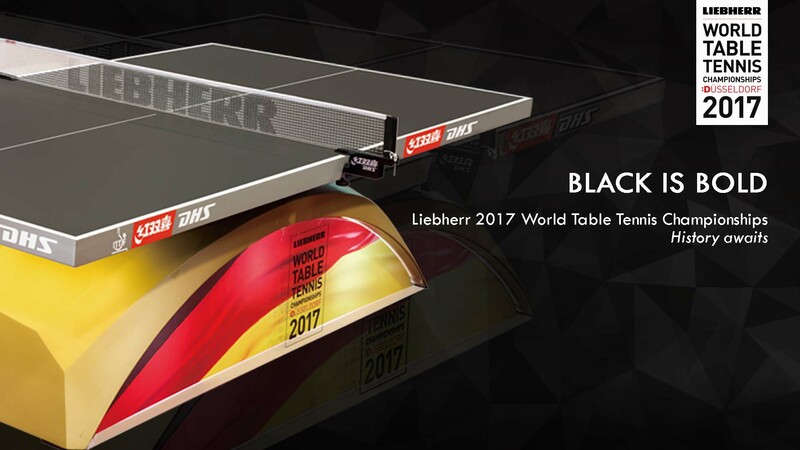 Double Happiness has unveiled the table design for the Liebherr 2017 World Championships, featuring a black finish to the surface of the table top in tune with the theme of ‘Black is Bold’.